The perfectly practical MDX is also one of the most powerful, most tech-savvy V6 SUVs on the road, giving it assured access to the top tier of any premium midsize SUV shopping list. If you prefer the softer, tamer side of a premium lifestyle, you might be more comfortable in the Lexus RX 350 or Buick Enclave. There are no major changes for 2011. In its pursuit of greater performance, the 2011 Acura MDX has given up nothing in practicality. For example, the MDX offers 15 cubic feet of cargo capacity behind the third row, which is just two cubic feet less than the full-size Chevrolet Tahoe. For bigger loads, both rear rows fold flat. The reclining second-row seats offer enough legroom for those six feet tall and more, while the third row is best suited for smaller folks riding on shorter trips. The MDX even offers a minivan-like 10 cupholders. Up front, the MDX is an attractive mix of sport, luxury and technology, with highlights that include perforated leather or premium Milano leather seats, wood-like or metallic trim and a collection of intuitive controls and LED lighting. Complementing its wide, low, aggressive stance, the boldly styled MDX features a shield-like take on Acura's 5-sided grille, thick wheel arches filled with 18-inch wheels and prominent oval tailpipes. High-intensity discharge (HID) headlights, mirror-integrated turn signals and LED taillamps further the cutting-edge appearance, as does a radio antenna that's been cleverly integrated into the rear spoiler. The MDX is longer, wider and taller, by varying degrees, than the Lexus RX 350 and Volvo XC90. The fact that Acura introduced the MDX on a racetrack with other high-performance SUVS says quite a bit. The fact that it was indeed the MDX that put the biggest smiles on our faces says even more. When pushed hard, the MDX's 300 horsepower, sophisticated all-wheel-drive system and optional active damping system combine to deliver an SUV that's fun to drive even at or near its limits. We were also impressed by the MDX's off-road ability, which we were able to sample on a short but extreme course. Fortunately, because very few will ever negotiate a racetrack or even a muddy trail, the handily athletic MDX is even more pleasing around town and on the highway than any MDX before it. The 2011 Acura MDX's Manufacturer's Suggested Retail Price (MSRP) starts around $43,500 and extends to just under $55,000 when fully equipped. As a recently redesigned, premium-badged vehicle, we expect our New Car Blue Book Values to reflect real-world selling prices fairly close to those MSRPs. The well-rounded, well-equipped MDX makes a worthy competitor to a wide-range of premium SUVs - from the Volvo XC90 to the Porsche Cayenne - with pricing that we feel compares favorably to anything in the category. As for resale value, we expect the MDX to perform better than average, on par with its closest rival the Lexus RX 350 and much better than Cadillac SRX or Lincoln MKT. Some of the bigger features included at base price include the powerful V6 engine and sophisticated all-wheel-drive system, 18-inch alloy wheels, leather seats, power and heated front seats, power moonroof, HID headlamps, Bluetooth hands-free phone interface, a 253-watt 8-speaker audio system with 6-disc CD/MP3/WMA changer, 3-zone automatic climate control, an auto dimming mirror, steering wheel-mounted audio and cruise controls, six airbags and electronic traction and stability controls. All of the 2011 Acura MDX's optional features are bundled into three packages. The Technology Package highlights include a sophisticated navigation system with an 8-inch LCD screen, AcuraLink real-time traffic and weather reports, Zagat restaurant reviews, plus a DVD-Audio Surround Sound system and power rear liftgate. The Advance Package features an active suspension, ventilated sport seats covered in rich perforated Milano leather, a sport steering wheel with paddle shifters, Collision Mitigating Braking System, Adaptive Cruise Control, blind spot information system, auto leveling HID front headlamps and 19-inch alloy wheels. The Entertainment Package includes a DVD rear entertainment system. With a navigation system that provides real-time traffic and weather info and an audio system that delivers amazing 6-channel Surround Sound via DVD-Audio disc, we'd be hard-pressed not to check this option box. Squeeze the throttle while in the middle of a corner and the MDX's Super Handling All-Wheel Drive system transfers more torque to the rear outside wheel, delivering truer steering response and perceptibly higher cornering limits. The MDX features Acura's most powerful engine ever, connected to a 6-speed automatic transmission and the Super Handling All-Wheel Drive system that distributes torque not only between the front and rear wheels, but also between the left and right rear wheels. In addition to cornering advantages, the system also makes for a less-intrusive stability control system. The available Active Damper System, in which the shock absorbers can change from soft to firm in milliseconds, helps mitigate the traditional trade-offs between a comfortable ride and spirited handling. The MDX features unibody construction and a fully independent suspension, and can tow up to 5,000 pounds with the added benefit of a Trailer Stability Assist feature. By combining manageable dimensions with 7-passenger capacity, a comfortable highway ride with responsive in-town handling and car-like construction with respectable off-pavement capability, the MDX has been one of our favorite SUVs since its introduction for the 2001 model year. In fact, as it trails only the Lexus RX 350 in category sales, the MDX has proven to be a favorite of many. 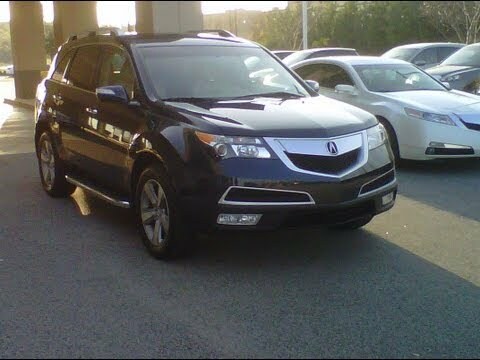 Last year, Acura gave its flagship SUV a few major upgrades which carry over onto the 2011 model. Fortunately, the characteristics that made the original MDX appealing are still present on the current version. Great luxury SUV for singles or families with older children. Vehicle drives pretty smooth and steering is pretty tight. Navigation feature is nice, although not exactly the easiest to use in comparison to other vehicles with subscription based communications, such as OnStar. Backup camera is great during the daytime, but nighttime sight is limited. Third row is convenient, but really only useful for children as not to spacious. Can fit three car seats across the middle row, which is a plus. however, with rear facing infant car seats, space is limited between car seat and driver seat and passenger seats respectively. So not ideal for individuals taller than 5 ft 6 in. All in all, the mdx is a great SUV especially with the recent improvements in models 2016 and newer. My vehicle is an Acura mdx. It is a super big and super comfy SUV. I love the performance of my vehicle. It drives just as well today as it did when I took it off the lot. I have had some issues with my tires being punctured, but I bought some all terrain tires and hopefully that will solve the problem. I have kept up regular maintenance on it, so it is lasted for 8 years. The only things I do not like is that my armrest is made of some cheap imitation leather and the inside door handle is peeling and I have cut my finger on it a few times. Great vehicle, needs work after 100, 000 miles. I would absolutely love the car if it weren't over 100, 000 miles and needing some repair work. Leather interior, Bluetooth calling, great sound system, heated seats, automatic everything. There really is not anything to complain about. It drives more like a big truck than most SUVs but it is completely reliable. I haven't used it in the snow yet, since I just got it in April but I am completely confident it will get me where I need to go without any issues.